The Parish Church of St Paul Harold Hill stands on a steep slope overlooking the eastern side of Petersfield Avenue, on the corner with Hucknall Close and next to the Most Holy Redeemer Catholic Church in Harold Wood. 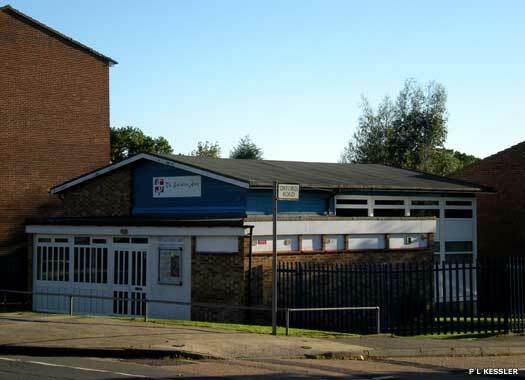 The church was built by St Peter Harold Wood in 1953 for the eastern half of the new LCC estate. In 1954 part of Harold Wood's parish was transferred over. A conventional district was assigned in 1955, and St Paul gained its own separate parish in 1956. The Salvation Army hall sits on the south-western corner of Petersfield Avenue and Oxford Road, nestling in a dip below road level. 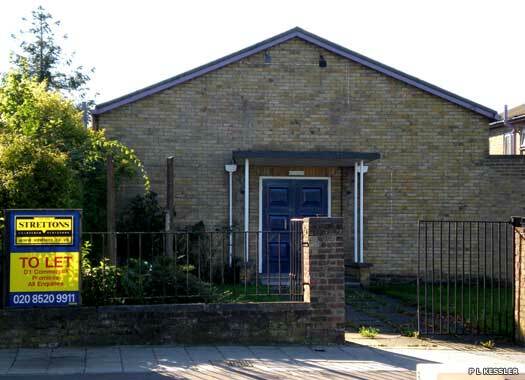 In northern Romford the Salvation Army had a hall in Collier Row Road, which operated between 1937-1941, before moving to Chase Cross Road, which they registered in 1942. In 1963 the Army built their present hall in Oxford Road. The hall is small and square, with an extension built to the front which now forms the main entrance. 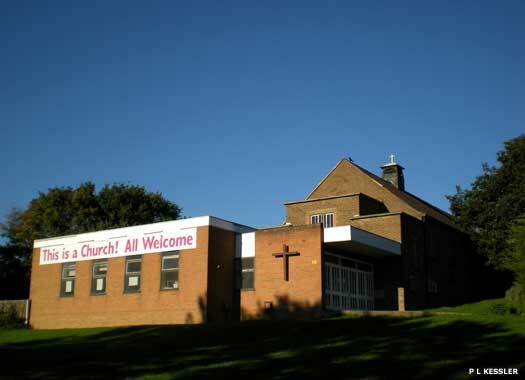 Harold Hill Christian Centre sits on a fairly long plot on the western side of Gooshays Drive, just north of Trowbridge Road in Harold Wood. 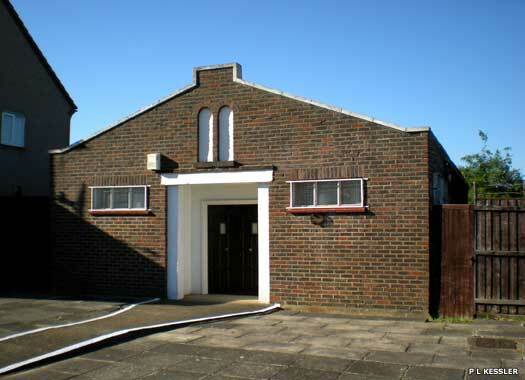 The London City Mission registered this hall in 1961. It was built in yellow brick with no ornamentation and a small garden area between it and the railings. An addition to the hall lies to the right of the photo. By 2010 the centre had been closed down and the property was being offered for lettings. Its final fate is unknown. Harold Hill Congregation of Jehovah's Witnesses lies on the northern side of Trowbridge Road, close to Gooshays Drive. Jehovah's Witnesses registered premises in Victoria Road in 1941-1942, in Eastern Road in 1951, and this one in Trowbridge Road in 1959. Of these, only the last remained by 1975, and remains so by 2010. The building is a standard square block in red brick with a yellow brick central strip, a style invariably used for many Jehovah's Witnesses halls. 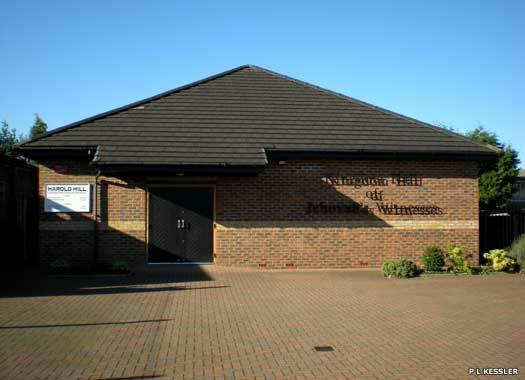 Harold Hill & District Affiliated Synagogue is on the northern side of Trowbridge Road immediately next door to the Jehovah's Witnesses hall (see above). The synagogue originated in 1953 when a congregation was formed. It became affiliated in 1954. Services were held in hired premises until 1958, when a pre-fabricated building was erected on this site. In 1962 the side walls of the synagogue were rebuilt in brick, making it the present permanent structure. St George's Parish Church & Centre Harold Hill occupies the southern side of Chippenham Road, opposite Farnham Road in Harold Hill. The church originated in 1939, with a mission being opened on Straight Road, for an area that was still largely rural. After the war it was well-placed to serve the western side of the new Harold Hill estate. In 1953 a new church was opened on the present site. A separate parish was formed in 1956. The old building was replaced about 2000. 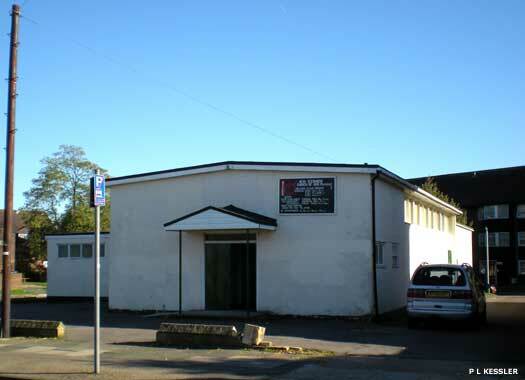 Harold Hill Evangelical Free Church lies on the southern side of Bridgewater Road, opposite Northallerton Way. 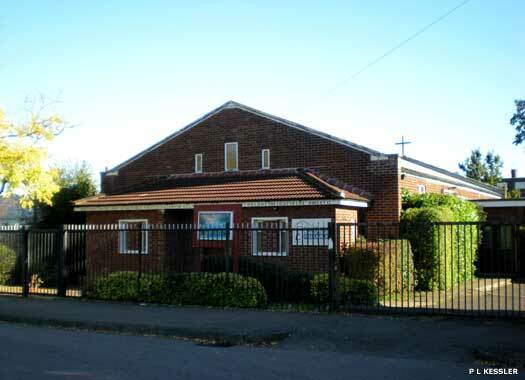 The church was opened in 1956, along with Collier Row Gospel Mission, with funds raised by the a lay preacher originally from Romford Evangelical Free Church. Both belong to the Fellowship of Independent Evangelical churches. By the end of the first decade of the twenty-first century, the church had a congregation of about fifty adults and twenty children. 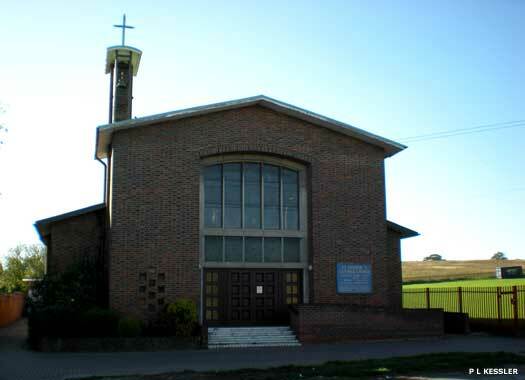 St Dominic's Catholic Church sits on the western side of Straight Road, a few metres north of the Grange Road junction and alongside the playing fields. 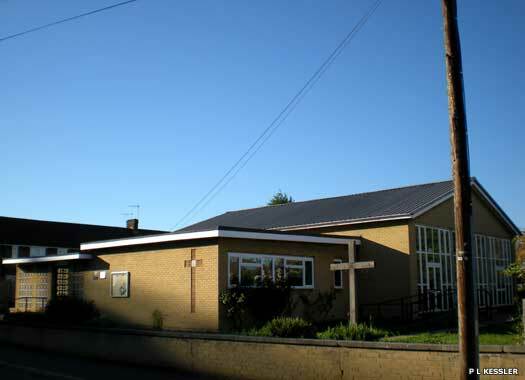 A new Catholic parish for the western side of Harold Hill was formed in 1954, as the estate there was being built, and the church was opened in 1956, with a primary day school attached. The building is of a fairly standard period red brick design with concrete insets around the doors and windows and a southern bell cote. Heaton Way United Reformed Church sits in the shadow of a tower block, on the northern side of Chaucer Road, midway between Sheridan Close and Cowley Road. 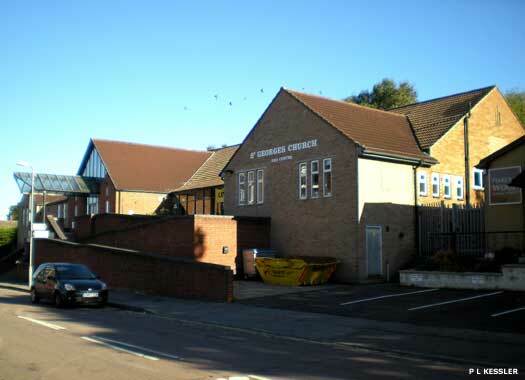 It originated in 1950, when Romford Congregational Church and Main Road Baptist Church opened a joint Sunday school. The Baptists left for Taunton Road in 1955. The Congregationalists eventually formed their own church in 1960, and in 1962 completed the building in Heaton Way. It became a URC building in 1972. Varley Memorial Hall stands on a plot that is open on three sides on the south-western corner of Briar Road as it hooks to the south from Straight Road. The hall was first registered by the Christian Community in 1962. It is a simple brick rectangular building, whitewashed, with a gently inclining felt roof and extra additions to the rear and side (both of which are visible here) By 2010 it was occupied by the New Testament Church of God: Pentecostal.